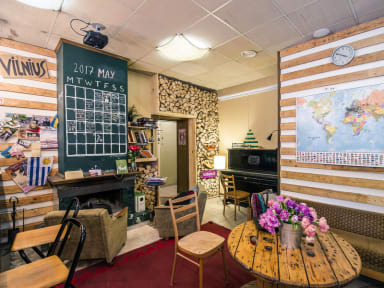 Downtown Forest Hostel & Camping i Vilnius, Litauen: Bestill nå! 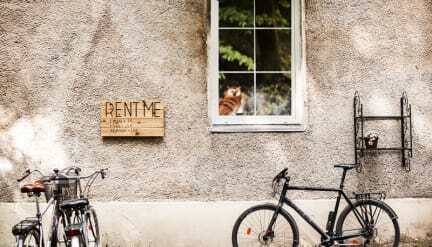 Downtown Forest Property & Camping is located down the hill the city center, in the artistic part of Vilnius called Užupis. Walking down, the spirit goes up because of the rustic and warm neighborhoods around. Main tourist spots are within a slow-walk distance: City hall (10 min), Cathedral (15 min), Bus & train station (20 min). Plenty of green areas around: newly opened park (7 min), river and ponds (3 min). And of course republic of Užupis just meters away. We call ourselves a forest, because we are located in a big house is surrounded by trees and a garden. Green is all around our not so fancy yet cozy chateu, as we call it. And the location is very downtown indeed. Peace and nature is what we have plenty of everywhere. Be sure, the rooms are not overcrowded. Outside the house we have a terrace for relaxing, and a camping ground just on the other side. This is definitely the coziest hostel I've ever been to! The staff is very friendly, the house itself is charming and the room and bathrooms are clean. The temperature dropped to -21C while I was there and it was nice and cosy to chill by the fireplace with a cup of tea and a good book. The hostel felt so much like home, and the living room/reception made it easy to get to know other people staying there, or just relax by yourself. I truly recommend staying here!